Environmentalists have raised the alarm about the huge amount of plastics finding their way into the Mediterranean Sea in Alicante, disgorged at the mouth of the Segura River, which runs through four Spanish provinces before reaching the sea at Guardamar, not far from the popular seaside town of Torrevieja. According to local activists, just two weeks after 20 tonnes of plastics were cleaned from the river by the Confederación Hidrográfica del Segura, the inter-governmental agency charged with maintenance of the Segura River watershed area, in mid-March an additional two tonnes were removed from waters near the mouth of the river by 500 local neighbours and activists coordinated by Greenpeace España. Activists say most of the plastic is discharged into drainage canals in the lower reaches of the Segura between Torrevieja and Orihuela and backs up in the waterways adjacent to an environmentally sensitive and protected wetlands area near mouth of the river at Guardamar. 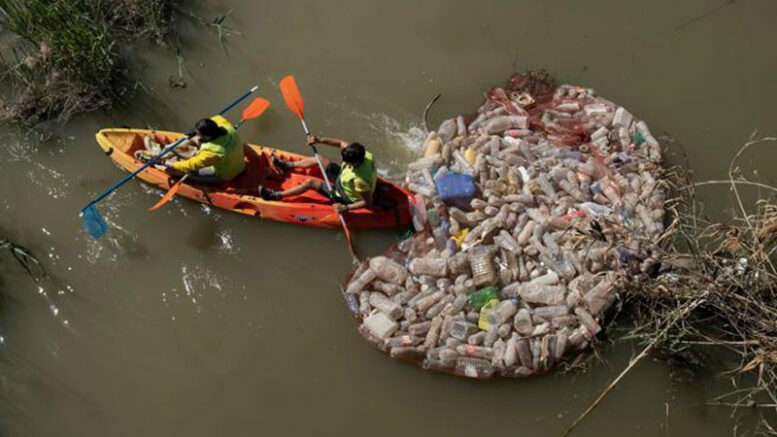 According to a spokesperson for the local Amigos de los Humedales del Sur de Alicante (AHSA, or ‘Friends of the Wetlands of Southern Alicante’), 95 percent of the plastic debris in the Segura consists of single-use containers for food, beverage and household use. Dumped in local fields and along roadsides, AHSA says the plastics are blown into drainage ditches that discharge into the Segura at times of heavy rain and are carried downstream by the River toward the sea. Greenpeace España, which is campaigning to eliminate plastics from Spain’s waterways, says only 25 percent of plastics in Spain are currently being recycled, with much of the remainder finding its way into rivers, streams and canals that discharge the plastics into waters along Spain’s Mediterranean and Atlantic coastlines.